The Love of Popcorn! Has kept us together for over 30 years. Kernels Popcorn is Canada’s #1 gourmet popcorn chain. Kernels Popcorn is made fresh, every day, at every store. Get and give the card that turns into Kernels Extraordinary Popcorn. The fun, delicious snack treat that is sure to deliver happy! Use the popcorn plastic card at over 80 of their retail store locations across Canada. 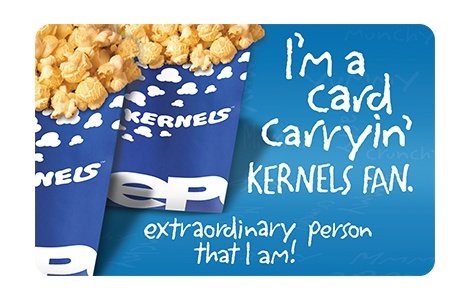 Order your Kernels Extraordinary Popcorn gift cards today! Purchase product and check remaining balance at any participating Kernels store in Canada. Register your card and view card balance and activity at www.kernelspopcorn.com. Issuer not responsible for lost, stolen or destroyed cards or any unauthorized use of card. User agrees to be bound by terms and conditions set forth above. Card cannot be redeemed for cash.